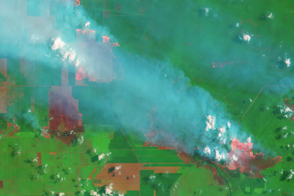 Although monsoon rains have started to quench many fires, heavy smoke poured from peat fires in Borneo, Indonesia, when the Moderate Resolution Imaging Spectroradiometer (MODIS) on NASA’s Aqua satellite captured this image on October 19, 2015. Red outlines indicate hot spots where the sensor detected unusually warm surface temperatures associated with fires. Gray smoke hovers over the island and has triggered air quality alerts and health warnings in Indonesia and neighboring countries. 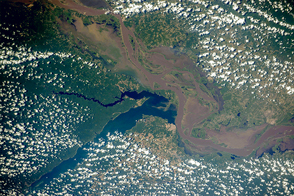 Small cumulus clouds are visible along Borneo’s southern coast. 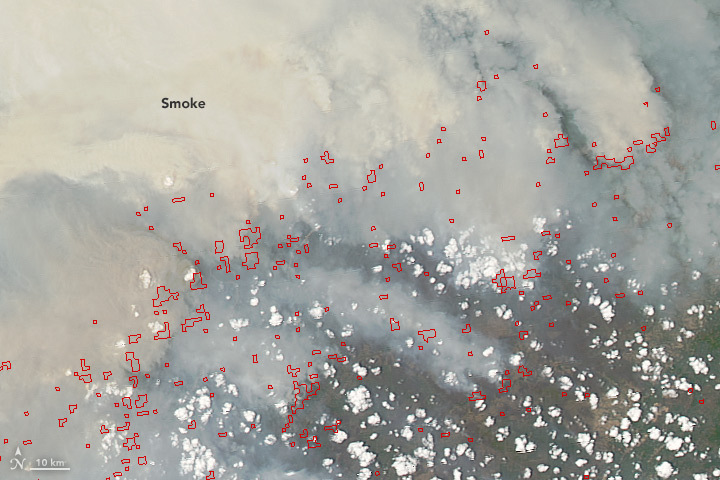 The lower image shows a more detailed view of some of the fires. Fires are a common occurrence in Borneo in September and October because farmers engage in “slash and burn agriculture,” a technique that involves frequent burning of rainforest to clear the way for crops or grazing animals. In southern Borneo, the intent is often to make room for new plantings of oil palm and acacia pulp. Many of the fires burned in areas with soils underlain with peat—a soil-like mixture of partly decayed plant material formed in wetlands. Peat fires tend to be difficult to extinguish, often smoldering under the surface for months. In comparison to other types of fires, peat fires release unusually large amounts of certain pollutants. For instance, peat fires release three times as much carbon monoxide and ten times as much methane as savanna fires, according to emission factors used by Vrije Universiteit Amsterdam scientist Guido van der Werf to quantify the amount of pollution released by the fires. According to Van der Werf, the fires in Indonesia have emitted an estimated 1.6 billion tons of carbon dioxide equivalents so far this year. That is more than the average annual emissions of Japan. MODIS sensors on the Terra and Aqua satellites have detected fires burning in southern Sumatra since early September. The 2015 burning season has proven to be one of the most severe Indonesia has faced in the last two decades. Akagi, R.J. et al (2011) Emission factors for open and domestic biomass burning for use in atmospheric models. Atmospheric Chemistry and Physics, 11, 4039-4072. Gaveau, D. et al (2014, May 7) Major atmospheric emissions from peat fires in Southeast Asia during non-drought years: evidence from the 2013 Sumatran fires. Scientific Reports, (4), 6112. Motherboard (2015, January 12) How Climate Change is Fueling the World’s Longest-Burning Fires. Accessed October 19, 2015. Mashable (2015, October 17) Indonesia’s peat fires have released more greenhouse gases than Germany does in an entire year. Accessed October 19, 2015. The New York Times (2010, August 20) The Fires Down Below. Accessed October 19, 2015. Time (2015, October 8) Watch Eerie Drone Footage of Indonesia’s Vast Forest Fires. Accessed October 19, 2015. Van der Werf (2015, October 19) Indonesian fire season progression. Accessed October 19, 2015. World Resources Institute (2015, October 8) Indonesia’s Fire Outbreaks Producing More Daily Emissions than Entire US Economy. Accessed October 19, 2015. 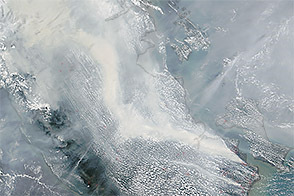 NASA image Jeff Schmaltz (LANCE MODIS Rapid Response) and Adam Voiland (NASA Earth Observatory). Caption by Adam Voiland. 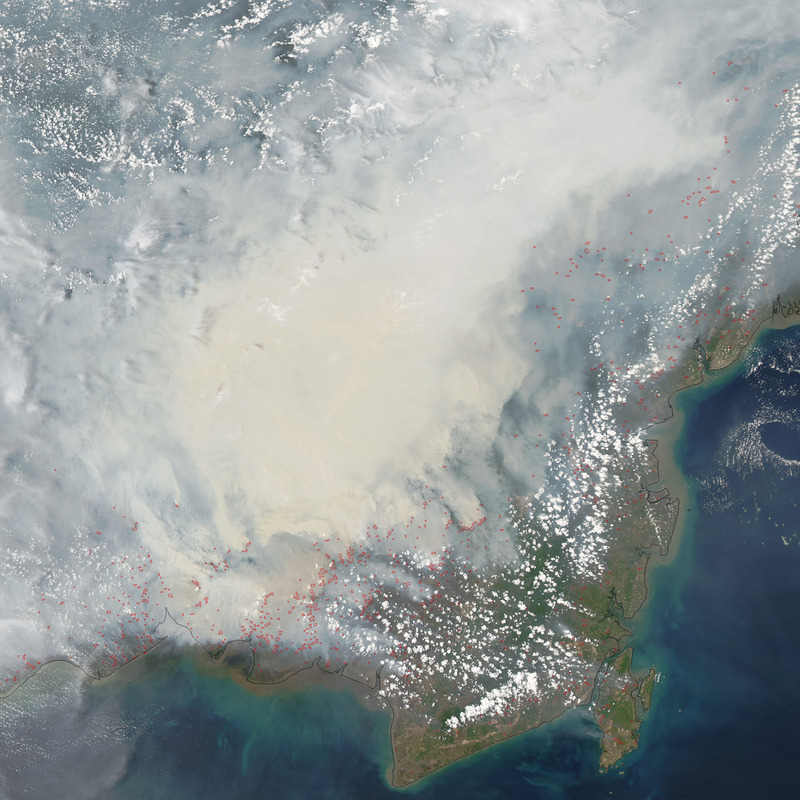 For much of October, smoke poured from fires in Borneo. 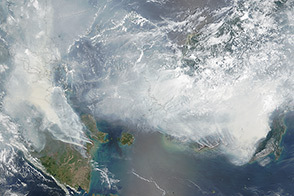 NASA Earth Observatory (2015, September 27) Smoke Blankets Indonesia. Accessed October 19, 2015. NASA Earth Observatory (2015, September 27) El Niño Strengthening. Accessed October 19, 2015.